Finally! 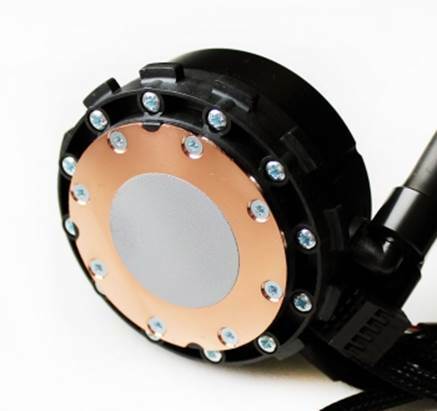 There comes a mass produced liquid cooling system with an affordably practical price, which is better not only the best air cooling systems but also its previous predecessors. In our review about the NZXT Kraken X40, we have been so pleased with the unique features and performances of that brand new liquid cooling system. Therefore, we wish to introduce to you this senior model of this range, which is more costly and named Kraken X60. 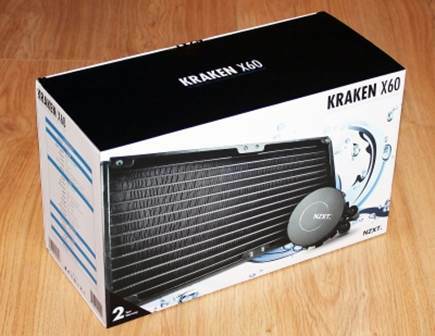 Different from its junior brother in terms of price, size of radiator and the number of fans, we absolutely put very expectation on this new product than the Kraken X40. Let’s see could Kraken X60 live up to our expectations. 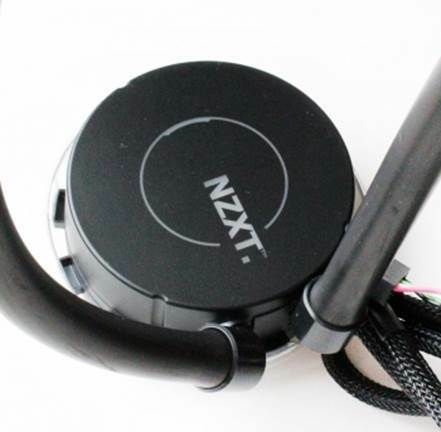 The NZXT Kraken X60 is packed in a quite large cardboard on which ornaments the product image. Just like the package of the X40, there are product’s specifications, main features and compatibility platforms on the side of the box. Inside you can find a cardboard tray with many compartments for each component of the system. It protects them from being crushed and damaged well enough during the transportation. 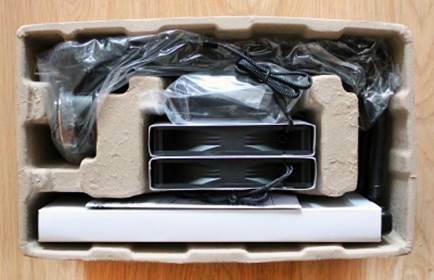 There are additional cardboard wraps for the fans and radiators, so the packaging looks very good and safe overall. 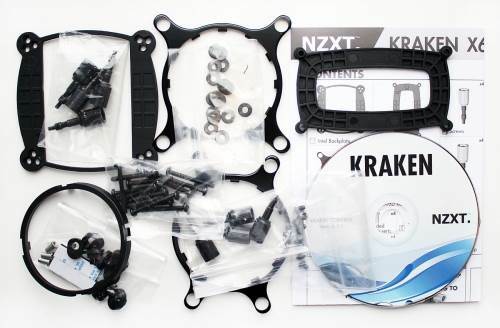 The accessories that we can find inside are quite typical for any liquid cooling systems and they are everything you need to install the Kraken X60 on any platform which is supported. Manufactured in China, this product costs $139, $40 more expensive than the Kraken X40, and comes with a 2 year warranty. Like any other ready-made liquid cooling system, the Kraken X60 is accompanied by a radiator, two tubes (which are 40mm long and 10mm in outer diameter), and a water-block/pump combo. What catches our eyes from the outlook of the Kraken X60 is the bunch of cables that come out from its pump. 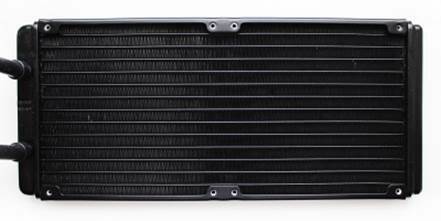 The main difference with its junior brother, the X40, is the larger radiator, whose dimensions are 314139x26.5mm. It is still made of aluminum and comes with 13 straight tubes which contain coolant. A stretch of rippled aluminum ribbon connects the pipes. The radiator’s body is just 16mm thick, just like in the X40. The same sticker can be found on a side of the radiator as we saw on the X40. This stickers contains information about the product’s name and power specs (12 V, 7.5 W – these numbers refer to the pump). On the opposite side of the radiator, you will find two fittings with press-fitted pipes. The water-block/pump combo is Ø72x32 mm in size. There is a mark on the top and its hinge is able to turn around for installing easier to the CPU. The pump performance is not estimated in advance and there is no additional information that can be drawn from its motor speed (regulate at 2900 (±150) RPM). There is a thin layer of high-efficient thermal interface pre-applied on the base of the water-block. 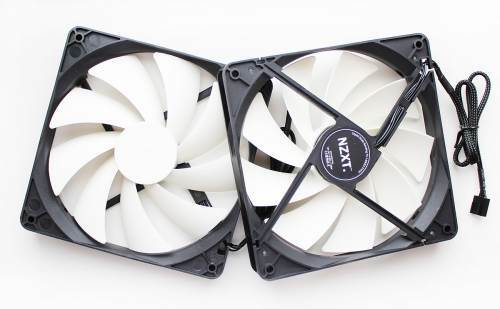 Accompanying the NZXT Kraken X60 are two 140mm NZXT FX-140 fans. 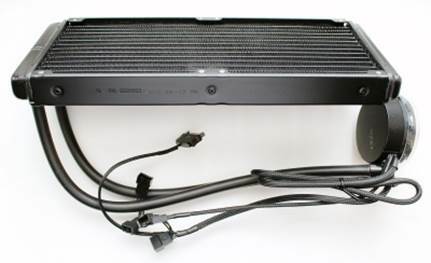 It is possible to adjust the fans PWM in the range of 800 to 2000 RPM. Each of them has the regulated airflow between 54 and 98.3 CFM at the noise level of 21 to 37 dBA and a static pressure from 0.8 to 2.2mm of water. The X40 also has the same figures for these specs. 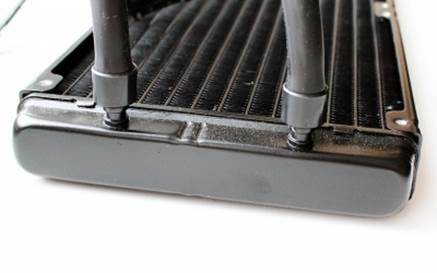 You can find additional screws among the accessories, which can be used to secure another pair of fans. The installation of this new model is just the same as its previous brother and their compatibility list is similar too. All you have to do is refer to the table cell which contains the number 280. As our computer case is not supported by the 240mm Kraken X60 radiator, we put the latter outside. 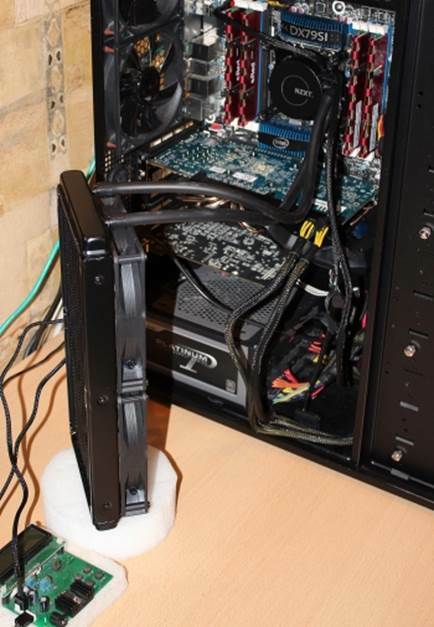 We placed the radiator down beside the computer on a piece of foam rubber. Methodology and testbed are just the same as what we applied in our Kraken X40 testing, so we will not describe them again here. All that we would like to add is that we planned to compare the X40 and the X60 (to come up with the differences of two models in the same range), Corsair H100i Extreme Performance, Swiftech H220 and super-cooler Phanteks PH-T14PE with two Corsair AF140 fans. Let’s go straight ahead to our testing now.